Our In-Patient Unit provides 24 hour care from specially trained nursing staff, supported by expert medical and allied health professionals, for patients with complex palliative care issues. Patients are referred by health care professionals involved in their care. All referrals are discussed by our multi-disciplinary team to ensure they receive the most appropriate service. Complex palliative care requires 24 hour assessment and observation, as well as specialist interventions, by expert staff to help and support both the patient and their family and carers. Patients come to us for specialist symptom management and end of life care, 365 days of the year, 24 hours a day. Due to the limited number of beds on our unit we are unable to provide nursing home care or long-stay beds. Typically our patients stay for 1-2 weeks, and we will support them to ensure they are cared for in the best place if the hospice is no longer required. Family and friends are welcome to visit between:- 10am to 12 noon and 2:30pm to 8:30pm. Any children visiting should be supervised at all times. Well controlled pets, such as dogs and cats, may be brought in to visit, providing they are under control at all times and are up to date with flea and worming treatments. 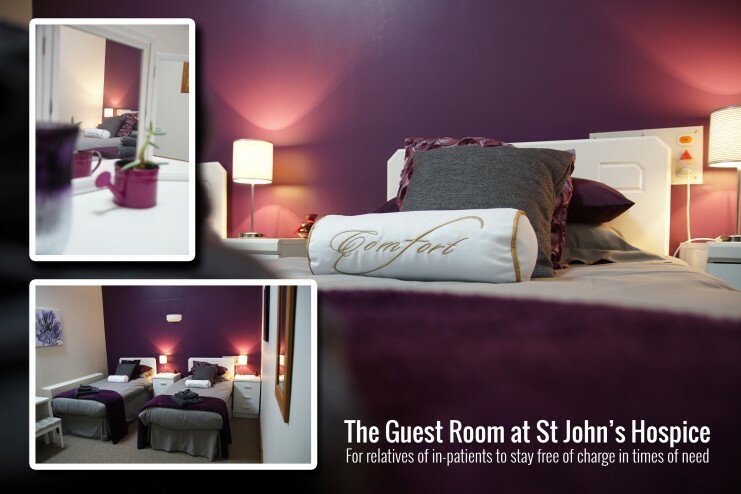 We do have some overnight accommodation for the family of anyone who is very unwell. Please ask the nurse for information. There is also a visitor’s book in this room; please feel free to leave a comment. Click HERE to view our in-patient information booklet. If you, or a loved one, is coming to St John’s, this booklet gives you lots of information about what to expect. If you have any additional queries or concerns, please get in touch. Our Guest Room can accommodate loved ones of patients in times of need, free of charge. There are other facilities available to patients and visitors. All the information can be found in the Ward Information booklet. Download it here or ask a member of staff for a copy. Tea and coffee making facilities are available free of charge. Meals for visitors can be ordered. There is an iPad available for patient and visitor use.